Even if you brush and floss your teeth thoroughly every day, you may notice your smile begins to lose its sparkle over time. Proper oral hygiene can go a long way to preventing stains, but things like aging, medications, coffee, tea and even some of your favorite foods can all contribute to tooth discoloration or yellowing. If you've considered whitening your teeth, you may already know the professional teeth whitening cost can be high — much more expensive than at-home alternatives. But in-office teeth whitening (often called chairside bleaching) is one of the safest and most effective whitening methods there is. Here's how to decide whether your condition is worth the cost. Many forms of teeth whitening, including over-the-counter (OTC) products, prescription gels and professionally applied treatments at your dentist's office, contain carbamide peroxide as their primary bleaching agent, according to the American Dental Association (ADA). 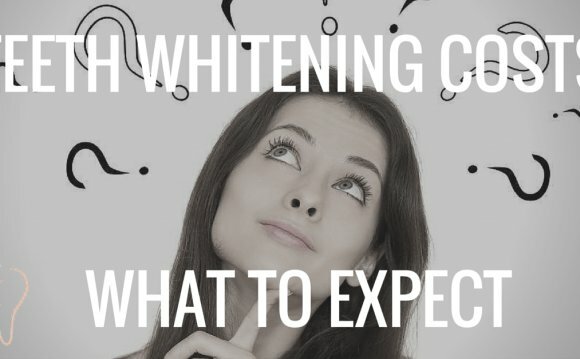 But the composition of chairside bleaching is what often separates it from the rest, making professional teeth whitening cost a bit higher as a result. Unlike at-home whitening kits, which contain low-dose bleaching agents, professional in-office whitening procedures are carefully monitored and contain a higher concentration of bleaching gel. For this reason, keep in mind some patients receiving this treatment do report a temporary increase in tooth sensitivity and mild irritation in the soft tissues of the mouth. Nevertheless, because the concentration of professionally applied bleaching gel is stronger than what you'd get in an at-home whitening product, results are visible immediately rather than several weeks afterward. At-home products, those offered by your dentist and OTC items, are intended for use over a two- to four-week period, whereas the in-office professional procedure is usually completed in about one hour. One of the major drawbacks to OTC products, such as whitening strips or bleaching trays, is that they don't require you to undergo a dental examination or consultation first. The ADA recommends that everyone considering a whitening treatment should have a dental examination to ensure their gums and teeth are healthy enough for bleaching, and in order to determine whether their type of staining or discoloration can be improved. In addition, some bleaching materials can affect filling material you may already have in your molars, and result in color mismatch with similar dental work. Once you've visited your dentist and have been cleared for teeth whitening, choosing a method to use is a matter of your budget and personal preference. If you're looking for fast results and a dramatic whitening effect, professional in-office whitening is your best option. If your teeth are hyper-sensitive, however, your dentist may choose to send you home with a custom-fitted whitening tray, which contains a lower concentration of bleach than an in-office treatment. There are also many affordable, safe OTC products available in your local convenient store. Of course more gradual whitening effects may be preferable for those who aren't racing toward a special occasion. Whitening toothpastes such as Colgate® Optic White® Express White are always appropriate, whitening teeth while sealing out future stains. And although these products do not work as quickly as professional treatments, they are extremely convenient in pursuit of the smile you deserve.